Wellbrook is a small British company that has earned a reputation for high quality products of innovative design and excellent performance. Their loops have set the standard against which others are compared and have been generally acknowledged as the best performing active antennas available. When you contact Wellbrook you deal directly with Andy Ikin, Wellbrook’s owner and designer. I used email exclusively and found that Andy responded to my questions although sometimes his answers were short and incomplete, requiring a few follow up emails to pin down further details. Other indications that this is a small operation is the Owner’s Manual which was custom printed for my purchase…it had a publish date which was my order date. The manual is generic and applies to several loop models although there is a model-specific spec sheet included. It did leave a few ambiguities, though, but after several weeks of experimentation, and several emails to Andy, other owners and reviewers, and I’ve managed to get those answers and I will share what I learned in the course of this report. I also noticed that there is very little information about these products on the Internet, probably due to their prices and their lack of traditional worldwide distribution, so I will provide as much specific information for the prospective purchaser as I can. Wellbrook products are not distributed outside of England, so you have to order directly; below are some links to help. A very tough decision was whether to get the ALA1530 or the ALA330S. Although they offer similar performance overall, the 1530 has more gain at mw frequencies, while the 330S has more gain at sw frequencies. 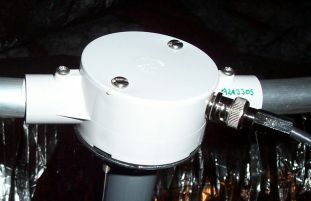 The ALA330S also resists overload and intrusion of strong, local mw signals into the sw bands. In my suburban location I figured that am overload was a marginal possibility. I emailed Andy and he quoted me the following figures: “…the 330S has 10 db more gain above 15 MHZ, while the 1530 has 6 db greater gain below 2 MHz”. I chose the ALA330S reasoning that since I do lots of daytime sw listening I really wanted the maximum gain at those daytime frequencies where signal strengths tend to be lower. Plus I already had some good am antennas so I wanted the Wellbrook to maximize my sw reception. I ordered through the Shortwave Shop, which actually appeared to forward the order to Wellbrook, as it was Wellbrook who informed me when it actually shipped. . Neither the Shortwave Shop nor Wellbrook offer secure online ordering, so they ask you to provide your credit card info spread out over 3 emails. Strange…yes, but everything went well. The ALA 330S shipped about 5 days later and arrived 19 days after that at my local Post Office (signature required), well wrapped in tough foam tubing. (See Picture) I had feared it would be in a huge box, but what I got was Hoola-hoop-sized, very lightweight and easy to manage into the car. At the bottom of the loop was a large bulge wrapped with plastic and duct tape. This contained the uPVC Box containing the head end amplifier, , the Antenna Interface box to connect between the loop and your radio, a mounting flange and hardware, and a 120 volt power wall wart power supply for North America. Andy has advised me to unplug the wall wart when I am not using the antenna, although after hours of operation both the interface box and the electronic module were cool to the touch, although the Wall Wart itself was slightly warm. As most of my equipment (except my radio which needs constant ac power to retain its clock settings) is plugged into a switched outlet strip that wasn’t a problem. Wellbrook also offers a 220 volt European version, but in other areas you have to provide your own power supply. It must be of the non-switching variety, 12 volt regulated with between 150 to 300 mA rating, with a 2.1 mm plug, center negative. It required some care to open the wrappings…many layers of plastic and duct tape, which I slit away with a razor blade, being careful not to scratch any of the contents. Everything you need is included with the exception of the coax to run between the loop and the Antenna Interface box. The recommended cable is RG-58C with BNC connectors on each end. Wellbrook states this cable can be up to 100 meters (about 325 feet) in length and that loss is minimal. For experimentation purposes I obtained a 100 foot length and a 12 foot length of RG-58. Substituting one length for the other I could detect no differences in performance. I recommend Radio Shack’s Twist On connectors…they are easy, secure, and are better at keeping moisture out of the line than some soldered-on designs. The Interface Box’s 50 ohm output is via a 4 foot cable fitted with a PL259 plug. The loop itself is about 1 meter in diameter, and has a small completely moisture-sealed uPVC can at the bottom which houses the pre-amp and contains the BNC female output connector. For outdoor installation Wellbrook provides a rubber boot which you use to cover this connector and seal it from moisture with coax seal or other weatherproofing material. Power for the amplifier is delivered through the RG58 lead-in coax. Cost of the ALA330S shipped was about U.S. $363. Type: Indoor or Outdoor, Active, Balanced, Remote, Untuned Loop. Frequency Coverage: 2.3 – 30 MHz, usable performance 150 KHz to 50 MHz. Directivity: Figure 8 Pickup pattern with broad lobes and sharp nulls. Omni-directional to high angle signals, directional to low angle and ground wave signals. (See discussion in the performance tests section). Before I permanently mounted the loop I tried it out sitting on the floor right in my radio room. This allowed me to compare it with my other antennas (built-in whip (am/sw), a Sony ANLP-1 (sw only), a 75 foot random wire (am/sw), Justice Twin Coil Ferrite and Select-A-Tenna (both am only), and to experiment with the Wellbrook’s directional characteristics. Between the antenna switches on my radio and an external switch I was able to have all antennas selectable for instant comparisons. I used the Wellbrook in this configuration for several days and learned much about its operation during that time. Next I moved the loop to the attic. My wood frame house poses few problems with indoor reception, and electrical interference is present but not overwhelming, as long as certain noisy dimmers and such are kept off. I added a rotor to the attic installation and recommend one strongly. (Radio Shack has one for $70 and it works well). Although the loop’s positioning is said to be more critical for nulling noise than for maximizing reception, I still find that many times I can improve a given signal with a slight adjustment of the rotor, and that I haven’t found one position which is always best for all stations. Certainly you can get by without the rotor, but it’s clear you will lose some reception on some signals without one. I next tried a temporary mounting outdoors, first at about 5 feet above ground level, later at about 25 feet. Wellbrook recommends you place the loop 5-6 meters from the house to minimize electrical interference. In my location, reception was slightly better outdoors, but not overwhelmingly different. I suspect that if you have a noisier environment within your home you may experience more on an improvement. At 6 metres distance from the house (about 20 feet), there was still some noise in the tropical bands…even at 50 feet there was still some, so it would appear that you get a lot of improvement in noise reduction at 6 meters, but it falls off very slowly after that. You may want to do what I did…conduct a preliminary scouting expedition with a portable sw radio…I did this to locate a good attic mounting spot as well as outdoors. What I did was to turn on my noisiest dimmers to generate a loud BUZZ on most am and sw frequencies, then walk around the house and see how it varied. You will learn a lot this way before you decide where to place your antenna. At a height of about 20 feet it seemed there was a barely detectable improvement in high frequency reception above 15 megs, as I had been told to expect, but in my temporary situation I did not have the ability to aim the loop at all at that height and overall reception was quite similar to what I was getting at ground level. Andy verified that “increasing height does make a small improvement about 15 Megs. 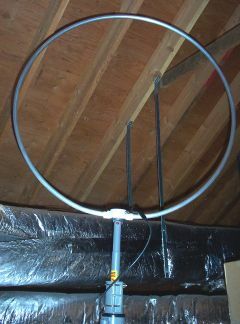 However, mounting the loop close to ground can reduce local noise.” Essentially, then, I found reception with the loop outdoors was marginally better than the attic location, but in my case, since local noise is not overwhelming, the attic mount was close enough that the simplicity of an attic mounting outweighed the hassles of mounting it outside. Here are some of the issues with outdoor placement of a Wellbrook loop. As we discussed, Wellbrook recommends ground level mounting as the best compromise for most situations, while some reviewers state the loop should be placed up high, and indeed, Wellbrook’s own site shows the loops up on high masts. I asked Andy about lightning and static safety. He recommends grounding the shield of the coax between the radio and the Antenna Interface Box to protect the radio from static discharges, but he also states that you CANNOT ground the shield coming in to your house from the Loop. Andy points out there is not much chance of a direct lightning strike at ground level. He also states the radio is protected from static as long as the coax is grounded at the receiver, and that you can ground the mast beneath the loop. I may someday choose to locate the loop outdoors about 50 feet from the house to get rid of the last vestiges of noise…time will tell. A few more comments about mounting: The Wellbrook does not come with a standard mounting arrangement. It does come with what is actually an electrical fitting called a flange, which screws onto the small weatherproofed amplifier box at the base of the loop. 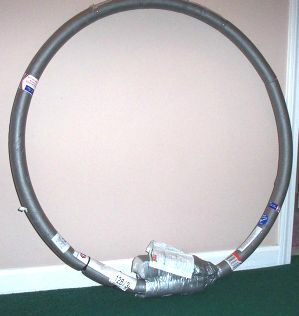 The mounting instructions furnished with the loop advise you to wrap this flange with PVC tape until it is tight when inserted into a standard mast, then to drill through and use a nut and bolt to secure them together. I found the tape wasn’t needed. I purchased a standard steel mast from Radio Shack…the kind with a narrowed top end which is designed to fit into another section of mast. I found that the flange was such a tight fit inside this tube that I had to hammer it into position. I don’t think it would ever come loose, but I did drill a hole and put a screw through the assembled pieces to lock them securely. It ended up being very easy to do. First and foremost, I learned that the Wellbrook consistently outperformed each of the other antennas by a comfortable margin, yet often it did not deliver the strongest signal as read on my S-Meter. That is, I could switch from another antenna to the Wellbrook and watch the S-Meter drop, yet the signal still improved due to a vastly greater signal-to-noise ratio. Of course, there were many instances in which the Wellbrook did deliver a stronger signal as read on the meter, but as often as not, the level was the same or lower, while sounding better. Even on am (and remembering the 330S not optimized for am as is the ALA1530), the 330S is still my best performing antenna! My medium distance am stations (Boston and New York City are each about 100 miles from my listening location in Connecticut) come in virtually noise free on the Wellbrook, and now sound very much like my local am’s. While the Justice Antenna might provide an S-9 or higher signal on these stations, the Wellbrook gives about an S-6, but the audio emerges from an almost totally silent background, whereas with the Justice or the random wire my computer whine and other electrical noises are right there with the audio. Another point to note is that not only is there less electrical interference with the Wellbrook, there is also less hiss…another surprise. Formerly, signals had to be about S-6 or so to be listenable at all…below that level there was too much noise to make them out. With the ALS 330S, signals which read as low as S-3 can sometimes sound fine! In fact, the Wellbrook has somewhat changed my concept of antennas and reception. Although I always realized that signal-to-noise ratio was the most important factor in any listening experience, I didn’t fully appreciate how much of the noise I was hearing could be reduced by antenna design. I am now able to receive many signals listenably that were just buried in noise before, so I have far more choices. Signal fading seems less bothersome too. It’s still certainly there, but the overall signals are so much more solid that the fades seem to affect them less. You can forget you are listening to shortwave as opposed to am more often making program listening (which is my main interest) much more enjoyable. I am able to use my computer in the radio room and it now has no effect on my reception. How Is All This Magic Possible? The Wellbrook delivers great performance for several reasons, but none of them are magic. They are all rooted in sound engineering concepts. First, all loops respond to the magnetic portion of the signal, rather than the electrical portion, which results in much lower noise. Second, the Wellbrooks are balanced designs, which means they can ignore lots of electrical interference that unbalanced loops and other antennas will deliver to your radio. Third, the nulls are far sharper than the lobes, which means as you rotate the loop, the desired signals can be heard over a large range of positions, but you can null out a local noise source with pinpoint accuracy. This differs from aiming a traditional antenna. In essence, you generally rotate the loop so as to null out noise or interference, as opposed to aiming for strongest signal. Once you realize this you begin to get the feel of how to use the Wellbrook. According to Andy this model is fairly omni-directional to high angle signals but extremely directional to low angle and ground wave signals with two sharp nulls. Occasionally this changes and you will be able to dramatically “peak” a signal with aiming, but generally you are reducing noise with it. These directional characteristics are very useful and virtually mandate the use of a rotor if you want to squeeze the absolute maximum out of this antenna. Fourth, the Wellbrook electronics are exceptionally quiet and have a large dynamic range, so they do not tend to overload as many active antennas do. Many loops are tuned, which means you have to adjust their frequency as you change radio frequencies. This is done to prevent overload from signals other than the frequency you wish to receive. It also mandates their use near the listening position which is usually where noise and interference are at their worst. The Wellbrooks are untuned, which makes them incredibly simple to use, yet due to their well-designed electronics, do not overload as many broadband designs do. This allows remote placement of the loop for best reception. The combination of all these factors means the Wellbrook may deliver the best listening experience you’ve ever had, unless you are fortunate enough to own a very long random wire or well-designed outdoor antenna in an electrically quiet location. It also occurred to me that since the Wellbrook’s strength is signal quality rather than high signal levels, it might work well with a portable radio. Never one to be deterred by plugging a $360 antenna atop a $70 rotor into a $50 portable I tried the Wellbrook with a Degen DE1103, and a Sony 2010 and SW77. Of these three, only the 2010 disconnects its internal ferrite rod antenna for am when a plug is inserted into the aux antenna jack, so the 2010 would have the advantage with the Wellbrook for am. Other than that, all 3 radios seemed happy as clams with the Wellbrook. They brought in a ton of dx caliber signals on all bands with little overload during the daytime…I did use the Local position for some night time listening. Since one of my future projects is to devise a battery backup power supply for the Wellbrook for use during power outages, it’s good to know it works well with portables, even though a good tabletop set will reveal nuances you will miss on any portable. It’s safe to say I have been extremely impressed with the Wellbrook ALA330s. I also feel safe in saying that, unless you have an excellent outdoor passive antenna in a good location, the Wellbrook will give you more reception with less noise and interference than you have heard before. As I compare the ALA 330S with my other antennas on both am and sw, almost every time the Wellbrook trounces the other antennas in overall listenability and number of stations receivable. Andy Ikin is to be commended for advancing the state-of-the-art and I expect we will see many more exciting products coming form Wellbrook. Does the attic installation represent a compromise? Yes it does, but even so, the ALA 330S has so improved overall reception here that I find it to be nothing less than a breakthrough. In fact, you will note in the pictures that my loop is in proximity to some large air conditioning ducts…this is not ideal from a purist’s point of view…they undoubtedly have some effect on the loop. Yet this spot was the overall best of several possible locations I tried in the attic, and as all antennas are partly trial and error, I’m not concerned about it. Overall, I feel well prepared for an exciting winter DX season!